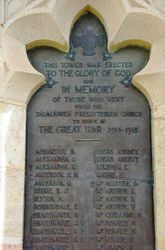 A tower of the church commemorates members of the Shoalhaven Presbyterian Church who served in World War One. The tower also marks the completion of the church. 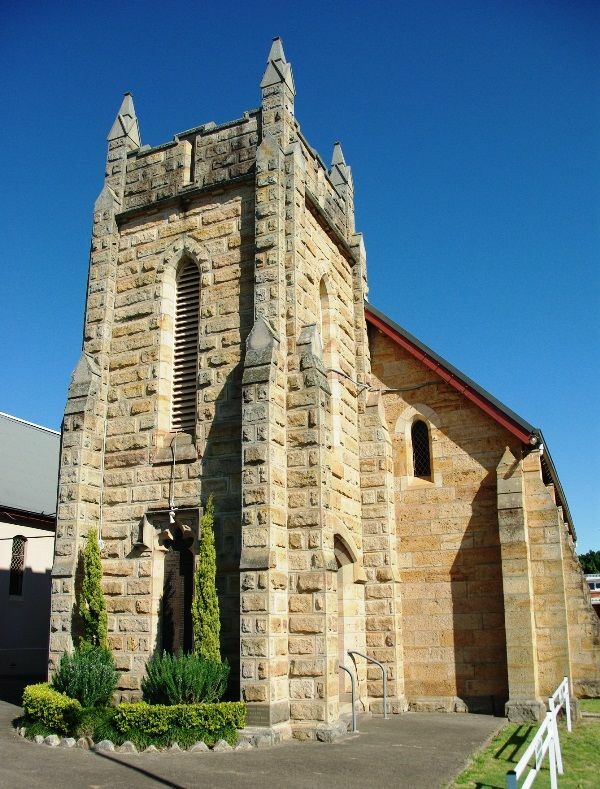 Good progress is being made with the tower in course of erection at the Presbyterian Church, Nowra, by the contractor, Mr. S. Goldsborough, and when completed the addition will undoubtedly give the sacred edifice an enhanced appearance. It is anticipated that the foundation stone will be laid within a fortnight's time. The erection of the tower is for a twofold purpose — that of completion of the church building and serve as a war memorial. It will be at a height of 12 feet, with pinnacles on the four corners, and a flagstaff entrances on the northern and southern sides. 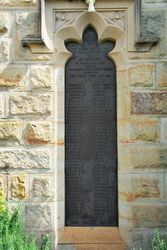 Fronting the tower, which will be facing Kinghorn-street, will be a handsome bronze tablet, containing over eighty names of members of the Shoalhaven Presbyterian Church who rendered active service at the war. The tower will also mark an epoch in the building of the Church inasmuch as it will be the Jubilee — of the opening of the Church. Two foundation stones are to be laid— one containing the date of the opening and the name of the Rev. W. Grant, M.A. — who was later Knighted Doctor — one of the earliest connected with it, and the other will mark the building of the tower. Nowra Leader (NSW), 16 October 1925. 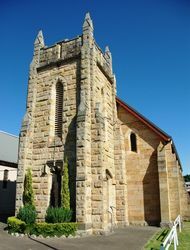 The foundation stones of the war memorial tower to be erected as an addition to the Presbyterian Church, Nowra, will be laid on Thursday next, at 2.30 p.m., one by Mr. M. S. Grant, son of the late Dr. Grant, and the other by Mrs. Auld, wife of the resident minister. One stone will mark the opening of the church 13th January, 1875, and the other the building of the tower, 22nd October, 1925. The architects for the job are Messrs. Power, Adam, and Munnings, and the contractor, Mr. H. Goldsborough. Shoalhaven Telegraph (NSW), 21 October 1925. One of the most outstanding functions in the history of Presbyterianism in Shoalhaven took place on Tuesday afternoon last, the occasion being the dedication of the new porch and tower forming an attractive feature in the architectural design of the Nowra church and the unveiling of the war memorial tablet, perpetuating the bravery of some 100 young men connected with the church who enlisted in the Great War, and intended to keep green the memory of those who made the supreme sacrifice in that titanic struggle for the world's freedom and the safety of the British Empire. Shoalhaven News and South Coast Districts Advertiser (NSW), 6th March 1926.